What's the bleeding time, Gareth? Mr Brown of Sidmouth is sporting a rather nice beard these days. Should I be worried? Only if he starts calling himself "Bluebeard." Yet for all Hutchinson's "accuracy",he got the name of the pub wrong. Police statement was corrected to The Queens Head without being initialed. Hutch may not have known the name of the pub on the corner, so Badham filled it in, realizing his mistake he corrected it - probably at the time of the read-through before the statement was signed. However it happened, it is not true to say the correction was Hutchinson's fault. He also describes button boots and gaiters. He could not see the buttons on the boots under the gaiters. You don't need to see the buttons to know they were buttoned boots. Don't you remember the Chelsea boot from the 60's?, also called winkle-pickers or chisel-toes, depending on the shape of the toe. They all had a Cuban heel and they did not lace-up, they had elastic side panels, one on either side of the boot. These elastic panels were covered by the pants leg (trousers, jeans), so you didn't have to see the elastic panels to know the boots were slip-on - you could tell from the style of the boot. The 'button-boot' was a style of boot, that's all he is saying. Something fishy going on there. Reckon he was a personal groom. Nothing 'fishy', just another case of the more 'we' learn, the more 'we' can understand. Seems like he borrowed part of the description from a photo of Sims......including the horseshoe pin. Clearly then, Sims was the only man in London to wear a horseshoe pin, well done Sherlock! You've probably solved the case. Who can see that kind of detail in the dark from the distance he claimed he viewed the man? If it was so clear, wouldn't Abberline have said so? After-all, his is the voice of experience in this, isn't he? 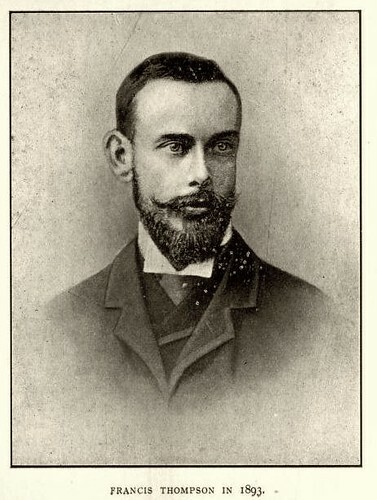 Francis Thompson, a modern suspect, had, by November, 1888. A beard. Thompson benefactor, the editor Wilfrid Meynell was friends with George Sims. Maybe a beard, yes. But I doubt at that point in his life, he was dressed like the toff Huthinson describes. ha ha Wickerman. Your sarcasm is rich, but off point. I wasn't suggesting Sims might be the killer. I was saying that the description seems to coincidentally mirror the pic of Sims. Even Sims states he was identified as the Ripper, but that doesn't make him so. You suggested Hutchinson used a photo of Sims as inspiration, as if to say Sims was the only man in London who wore a horseshoe tie pin. It was likely very common among gentry involved in the owning or training of horses. Why should Hutchinson 'need' inspiration for any part of the description he gave? In the dark,nobody could discern buttons under gaiters from any other form of securing the boots. Used to wear "Chelsea boots" in the 1960s. All were zip ups. Currently have an English pair which are pull ons. Out of several pairs,only one pair had Cuban heels. Hand made in Collingwood. Curiously,Queen Victoria popularised J.Sparkes-Hall's Patent Elastic Ankle Boots. Right, but as I say, he didn't need to see the buttons to recognise a button-boot style of footwear. You didn't wear gaiters with shoes, you might wear spats, but a gaiter suggests a boot to start with, and a man's dress-boot required a gaiter. Mens boots were normally button-up. There's no mystery here. Sounds familiar - one of the reason's I have so much foot trouble these days, spending too many years in boots like that. I did have zipper type's too, but the zipper could be seen below the hem of the pants. Actually horseshoe pins were a favorite among sporting types and gamblers. A quick google of Victorian men's button boots suggest that a large proportion had integral gaiters. So perhaps Hutchinson was describing a single item (or pair of)? Incidentally, Chelsea boots date back to Victorian times - the queen herself popularised spring- sided boots. And Polly Nichols was wearing a mens pair when she was murdered. Button boots were basically dress boots with integral spats. The gaiters would have been to protect the integral spats. There are photos on the Internet of both. Apart from my English Chelsea boots,there are a pair of zip up winkelpicker "beatle" boots and a pair of real cuban heel cowboy boots in the shed that I'd forgotten about. You would require Hutchinson's eyesight to see the bit of zipper on the instep under the trousers.